Eggless Date and Walnut Cake is low fat, healthy, wholesome and delicious. 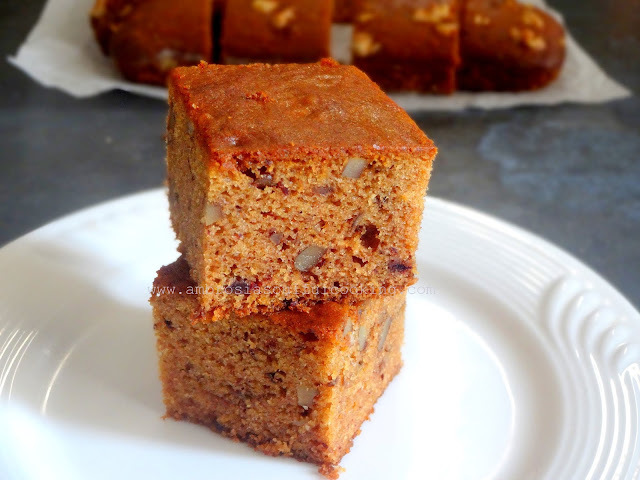 It has a lovely flavour of dates and crunch of walnuts. It is early late morning. The Sun is strong and angular, pouring golden hue on the tree tops. 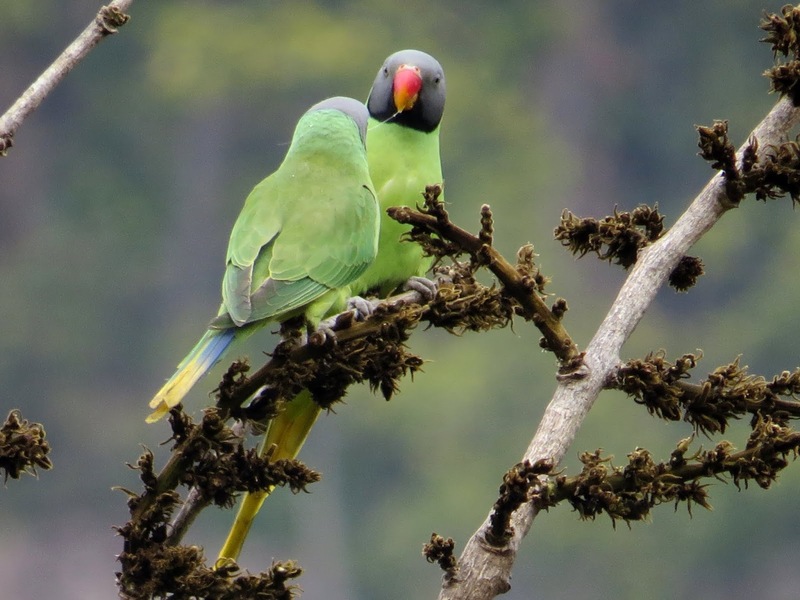 A flock of Parakeets fly in a line screeching and making their presence known. 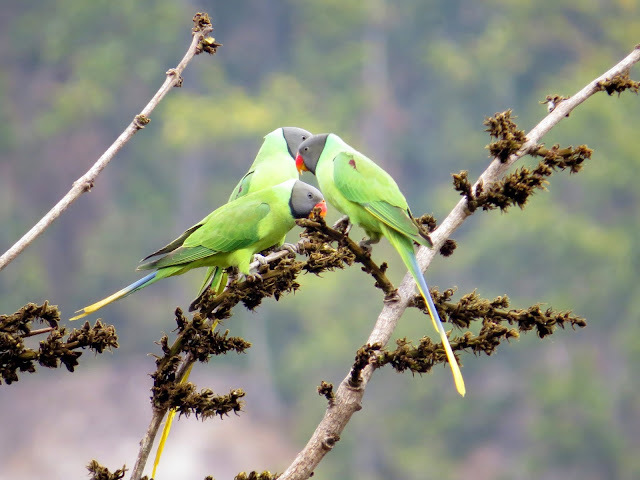 Soon they settle atop a tree that has some fruit or dry berries that seem to be of gastronomical preference to them. Screeching gives way to sweet calls and whistles and the flock settles itself on the trees. Later in the evening, we get busy baking our favourite cake. 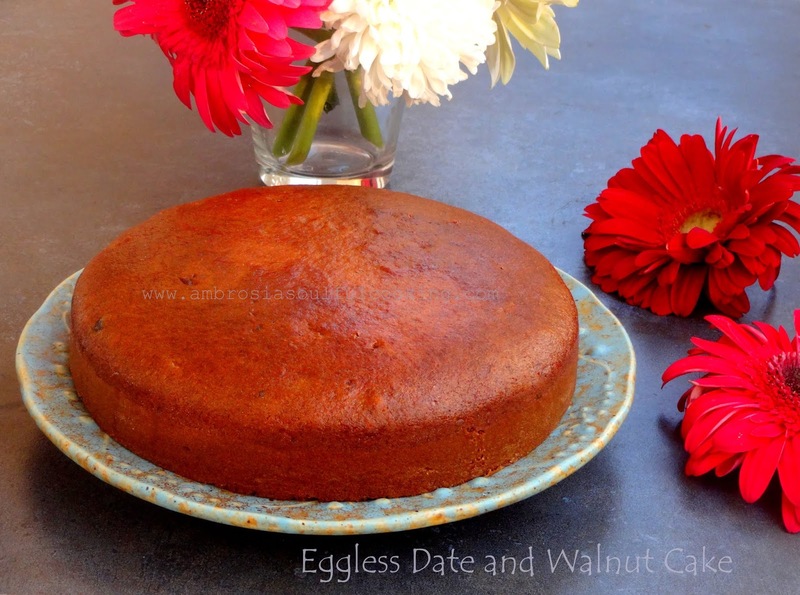 It is an eggless Date and Walnut Cake. 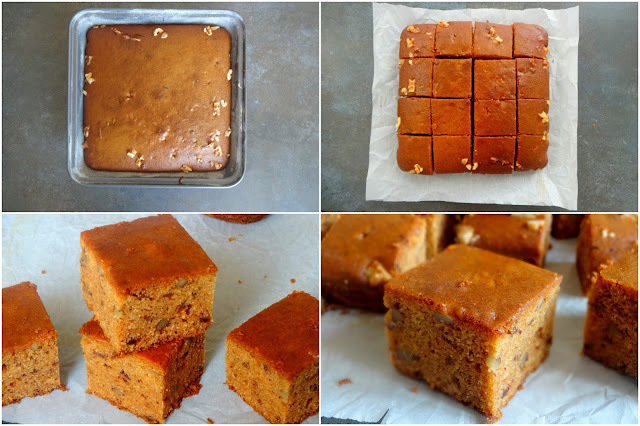 One recipe that is loved by the family is the Date and Walnut Cake. 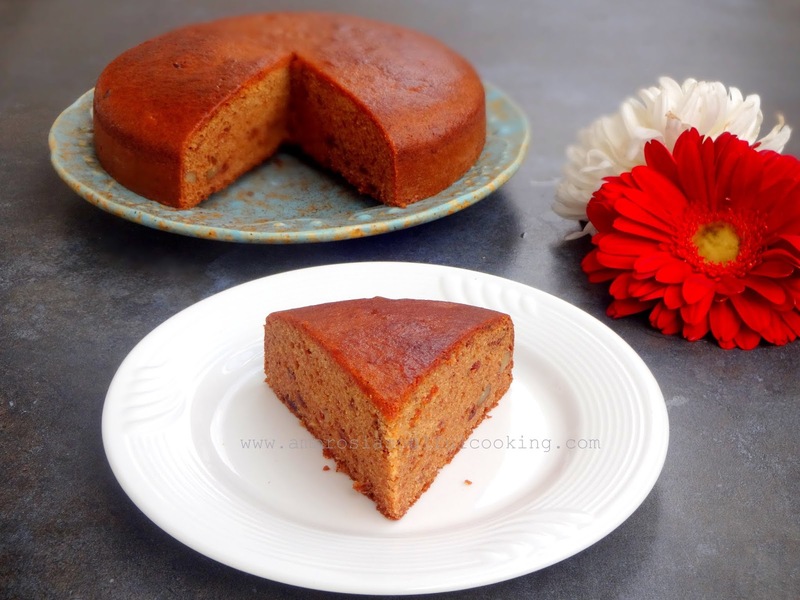 Whenever we have a tin of condensed milk at home, this cake is a must bake. Pureed dates and crunchy Himalayan walnuts make it really delectable. It has been baked with whole wheat flour and oil. It is healthy, wholesome and delicious. This is a great snack cake. Kids love it. It has a great crust and an airy crumb.Walnuts add a great crunch and taste. 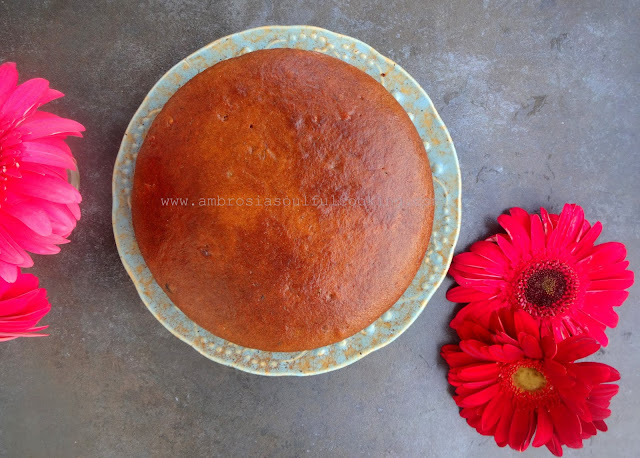 Grease and line one 8 inch round cake pan or one 8inches x 5 1/2 inch rectangular baking pan. Sift whole wheat flour with baking powder and salt. Take chopped dates in a large pan, add six tablespoons water and simmer for two minutes. Turn off the gas. When dates and water mixture becomes lukewarm, add baking soda and let it rest for 20 minutes. In the same pan, add oil, condensed milk, and milk. Stir till smooth. Add vanilla essence. Add flour and mix well to get a smooth batter. Grease and line one 8 inch x 5 1/2 inch baking tin or, one 8 inch round cake tin. Pour the batter and bake in a pre heated oven at 150 degrees C for 45 minutes or till a skewer inserted in the center comes out clean. Remove the cake from the oven and remove from the baking tin after 15 minutes. Hello! Thank you for visiting my blog. This recipe is egg less. However, you can avoid condensed milk, add 1/2 to 3/4 cup powdered sugar as per your taste. Beat egg whites, add powdered sugar followed by oil and then yolks. Then fold in rest of the ingredients. Add walnuts and dates in the end. Hope this helps. Hi Avni, I think for 3/4 cup ata, two eggs would be fine. I have never tried though, but should work well. If you try this one, I would love to know your feedback. Happy Baking Avni! tried the recipe today with 2eggs and 1/2 cup sugar. Added just a bit of cocoa powder.It came out nice and clean. Its my daughter's first birthday today as per hindu calender...this cake will have a special place in my heart always. Hello Avni, I am happy that your experiment worked well. I admire your baking skills Avni. I think next time when I try the same cake, i too, will add cocoa. Great idea. Happy Birthday and good wishes to your lil angel. I tried...really got good result. ThNk u so much. Hello namita, is 1/2 tin condensed milk is equal to 200g ? Yes Mitali, 1 tin condensed milk is 400g. Half would be 200g.